The Estate Swing Driveway Gate collection brings a clean-lined appearance with upgraded material/design elements. By incorporates classic artistry, sturdy wrought aluminum alloy and a smooth powder coated finish Estate Swing offers a quality U.S. made gate available to authorized distributors. Unlike other gates where automation is a secondary thought, Estate Swing recognized the need for operator placement from the start; therefore end-user automation preferences were considered beforehand. 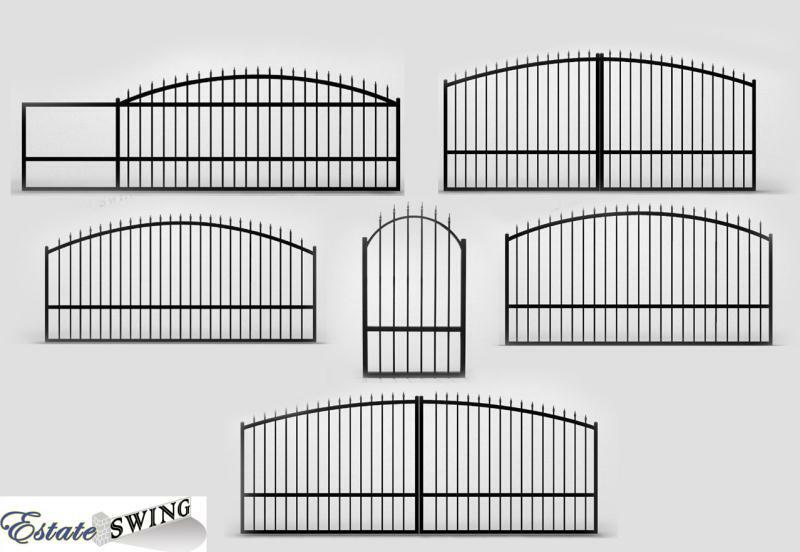 With a variety of sizes in both single and dual, the Estate Swing Driveway Gate collection bring consistent quality to the forefront of today’s market demand. By using wrought aluminum as the base metal instead of steel it creates a stronger lighter weight gate, which in turn, is safer for people and objects as well as benefits the operator motor since it puts less strain on the gears. As gate automation professionals, Estate Swing sought to anticipate the needs of consumers and incorporate those details when designing this dynamic driveway gate. Professional and the DIY installers are thrilled: It’s easy to drill, easy to lift, easy to automate. Estate Swing Driveway Gates are made with 6061-T6 wrought aluminum alloy and then powder coated for a protective seal and uniform color. The 6061-T6 wrought aluminum is a high-grade alloy with a yield strength of about 40,000 pounds per square inch*. For comparison, this is much stronger than “mild steel” which has a yield strength at about 20,000 to 30,000 pounds per square inch. Furthermore aluminum will not rust. 6061-T6 wrought aluminum is used for the purpose of durability and resiliency, providing a quality dent resistance and lasting beauty. Powder coating is the process by which powdered pigment is applied to and cured on a surface. It consists of a mechanical and/or chemical treatment of the surface to remove impurities and contaminants followed by the application of the pigments. Then the material is cured at high temperatures which makes the pigments flow together and react chemically to form the coating. Powder coating is preferred for certain surfaces because it creates or contains close to no volatile organic compounds and does not sag or run with thicker coats. The overspray can also be recycled so there is little waste, making it less expensive and creating less hazardous waste. Our Estate Swing Driveway Gates are powder coated to provide the most uniform appearance possible. And a matching garden gate! Remember, the Estate Swing Driveway Gate Collection offers the only non-custom gates built for and ready for automation!